﻿ Create a Nonprofit Email Rubric to Grade Each Email Before You Send » Red Mango Marketing! Back in the day, when the teacher passed out a new writing assignment the whole class groaned – unless there was a rubric attached. Actually, the other kids were probably still groaning, but I was relieved. A rubric meant that no matter what I wrote about, if I could hit the targets the teacher was looking for, I’d get the grade I wanted – an ‘A,’ followed by plus marks written on blackboards all around the classroom. 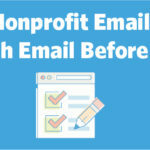 You can make sure each of your emails are worthy of the top grade by creating a rubric that helps your nonprofit email marketing start to overachieve. Learn how to grade your emails before you hit send to help your audience pay attention and feel compelled to donate. How successful is your email marketing? Check out our upcoming webinar: Measure Your Nonprofit’s Email Marketing Success with Reports. Once you’ve created your email, it’s good to step away and take your mind off it before coming back to polish it up. With a fresh pair of eyes, you’re more likely to see common spelling or grammar mistakes that you didn’t see the first time around. These simple mistakes can contribute to a poor reception of your email. These simple mistakes include broken links, the wrong video, or improperly formatted images. Constant Contact’s Error Checker feature makes it easy to double check for simple mistakes with the push of a button. Make sure to send out a test to different people on your team and double check how it looks on different devices and browsers. Once your email is polished, bump it up a grade with a better call-to-action. The feature that makes your email above average is a clear call-to-action that tells your audience what they should do next. Your entire email, from subject line, to your header photo, to the body text, should all push readers towards the button that will take them to your website, your donation page, or a blog article to learn more. You can boost conversion in your emails by telling your audience a story that relates to your cause, sets up your next fundraising event, or explains why your nonprofit organization needs donations to complete your next goal. A/B testing can help you test which call-to-action will lead to the best results. A better call to action can boost your email’s grade, but a B grade means there might still be something missing, and that’s real value to your audience. Like the essay that makes the rest of the class look like a bunch of slackers, the email that gets an ‘A+’ rating will hit all of the necessary requirements, and go that extra mile to really stand out. The email that consistently provides to your audience will be the one that gets clicked on, and you can start by putting the needs of your volunteers and donors before your organization’s. Your audience needs to feel appreciated, and putting their needs first makes them feel like you’re on their team. Talk to your volunteers and donors to find out their number one problem, in a way that relates to your organization. If your cause is cleaning up a local river, and your audience says the reason they aren’t getting involved is because of lack of time, send an email that highlights a few simple, fast ways they can help. Sometimes teachers need a great example to give them a standard to hold the rest of the class against. Pour through the emails in your own inbox and find the ones that have resonated with you and the ones that made you purchase or contribute a donation. The ones that moved you will help you create emails that move your audience. For starters, look for emails that are striking in their design, the ones that look so good you almost want to hang them up. Then, make sure each email you design at least comes close. Next, look for emails with body copy and subject lines that stood out, often the funny or personal stories can pull you in. Use these emails to create a rubric that helps you create better emails each time. Instead of groaning every time you need to craft a new email, design a rubric that will help you score big with every send. Your audience wants to hear from you, but your emails need to be properly formatted, have a clear call-to-action, and provide real value in order to score a passing grade. Create an email marketing rubric to turn your nonprofit organization into an overachiever. The post Create a Nonprofit Email Rubric to Grade Each Email Before You Send appeared first on Constant Contact Blogs. This entry was posted on Friday, September 21st, 2018 at 8:00 am	and is filed under email design, Email Marketing, News & Updates, Nonprofit. You can follow any responses to this entry through the RSS 2.0 feed. Both comments and pings are currently closed.